Latvia has limited progress when it comes to implementation of recommendations from the European Commission. Nevertheless, Latvia does not fall from the general EU context, when most member states have a small or limited progress with recommendations, said EC Vice-President Valdis Dombrovskis during a joint meeting with Latvian Saeima’s committees. Commenting on the opinion voiced during the meeting that EC’s opinion is rather critical, Dombrovskis said he believes the situation in Latvia does not differ much when compared to other member states. Additionally, a comparison of reports on different member states shows than Latvia’s situation is more positive. Dombrovskis said Latvia continues rapidly developing, exceeding EU’s average indexes in the process. He also added that Latvia does not have any signs of macroeconomic imbalance. He explains that the government’s submitted 2019 budget project generally fits stability and growth pact requirements. However, the budget lacks room for budget deficit increase. Additionally, unlike Latvia, Estonia and Lithuania have already achieved budget surplus, said the politician. Dombrovskis said EC believes Latvia’s tax reform will only partially achieve set goals, adding that it is still necessary to continue working on reduction of the tax burden for people paid the lowest wages. This requires closer ties between education offer and labour market, said Vice-President of the European Commission. 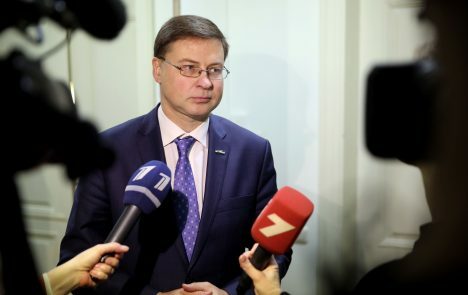 Limited progress has also been noticed in healthcare, as well as some progress in management of state and municipal enterprises and protection of whistle-blowers, said Dombrovskis. EC expects member states to submit their national reform programmes to be added to their respective budget’s medium-term goals. Once this has been done, European Commission will commence preparing specific recommendations. These will be published around the beginning of June, said the politician. Dombrovskis voiced his position at the joint meeting of Latvian Saeima’s European Affairs Committee and Social and Employment Matters Committee.